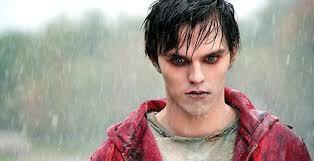 Warm Bodies - Jonathan Levine – Nicholas hault plays a zombie (named ‘R’…as he distantly recalls his human name beginning with an ‘R’), a shuffling member of the mumbling undead…but, as voiceover reveals, his human consciousness is intact. Trapped in the shuffling gait of his cadaverous body there remains frustration, a human sense of compassion and the vague and murky memory of his life before. In a post zombie apocalypse the remaining humans are penned in, quarantined from the infected hordes that wander the rest of the city. The man in charge of this last island of untainted humanity is John Malkovich (obviously…), in a an uncomplicated role of alpha and paternal, military leadership. He has a daughter, ‘Julie’, played by Teresa Palmer - who looks uncannily reminiscent of Kristen Stewart if she was blond. Julie and a group of others are innvolved in some sort kind of vague mission. They are ambushed by zombies, one of whom is ‘R’, and most of them are killed – including her at the time boyfriend. So…after the feeding frenzy ‘R’ shows his unorthadox zombie charity by saving her. It is, thankfully, a comedy.